As summer comes to a close, and all the great produce starts to disappear, we suddenly have the biggest cravings for all the fruits and veggies that are won’t be around anymore come fall. So, when Cindy and Nugget came across the best watermelon of the season during a little trip to a peach orchard in Calhoun County, Illinois while on a trip with their sweet friend Jackie, they knew they had to make the most of the delicious watermelon souvenir. Along with the watermelon, Cindy picked up some fresh tomatoes and the juiciest peaches we’ve had in years. All of us at Blended Kitchen were excited for the last of the summer produce! We got to thinking about what we could do with the watermelon, and Cindy remembered a party she and Peter went to not long ago. 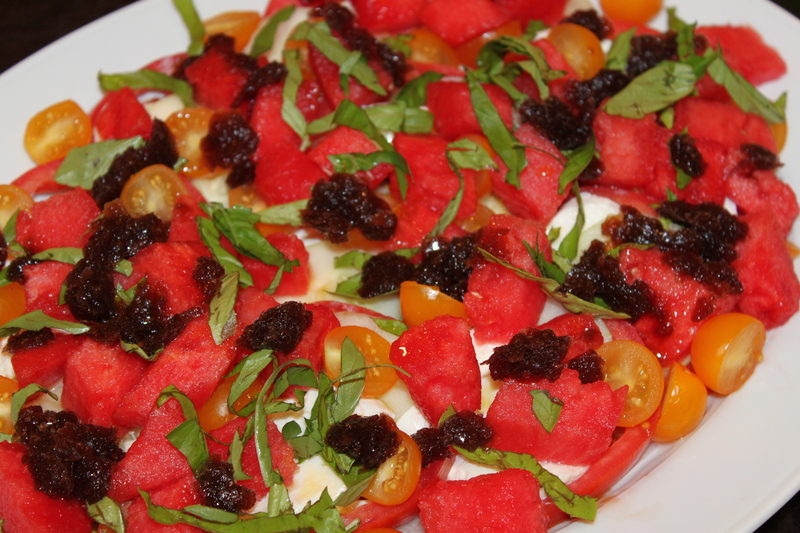 A woman there made a fabulous watermelon and tomato caprese-style salad with a delicious balsamic granita to top it off. We decided to put it to the test based on a recipe found in Food and Wine magazine. The results? It tasted like everything we love about summer in one phenomenal bite. 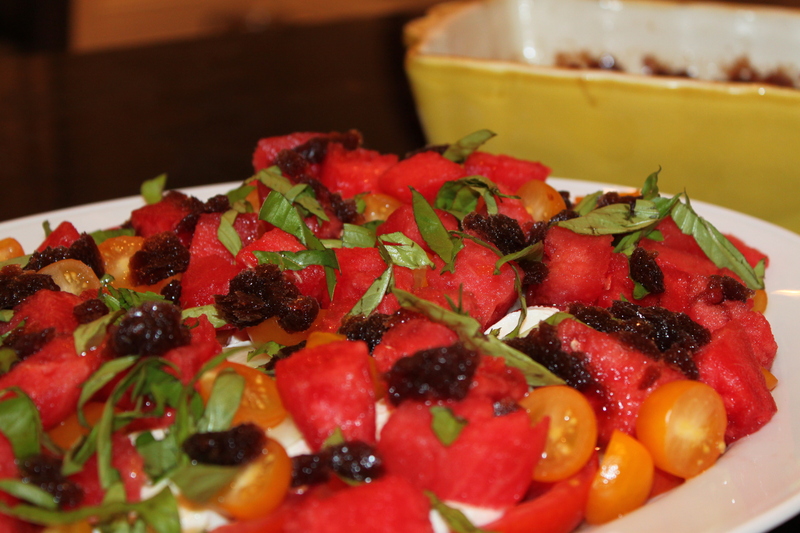 If you are a fan of caprese salad, this twist on the dish will wow you and your guests. Trust us, you’ll never go back. 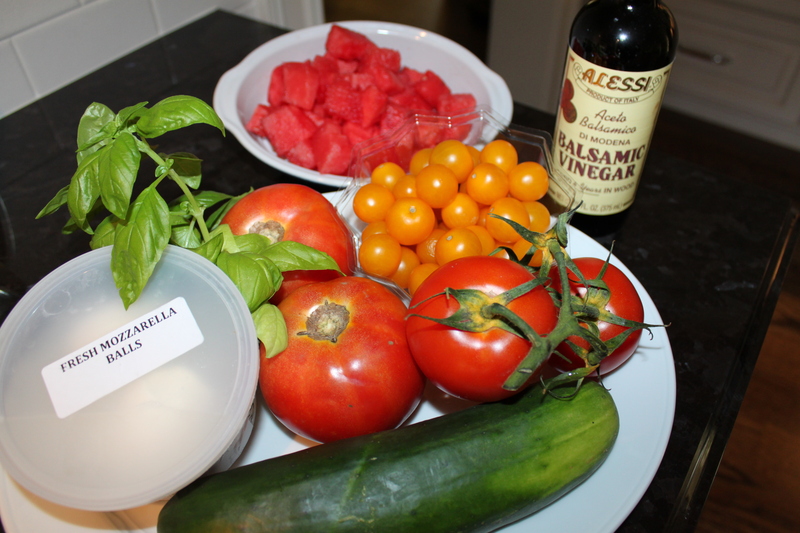 Start with the traditional caprese ingredients: mozzarella, tomatoes and basil. Then add the watermelon and cucumber to kick it up a notch! 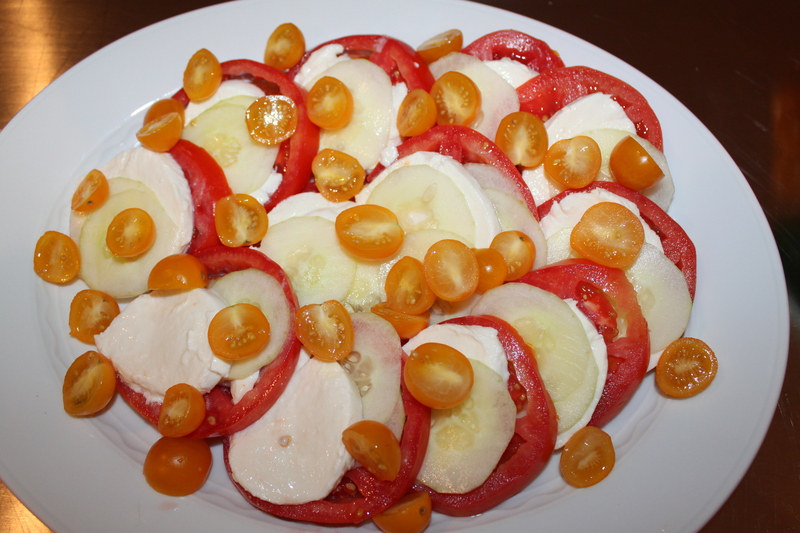 Arrange the sliced tomatoes, cucumbers, mozzarella cheese and cut tomatoes on a platter. 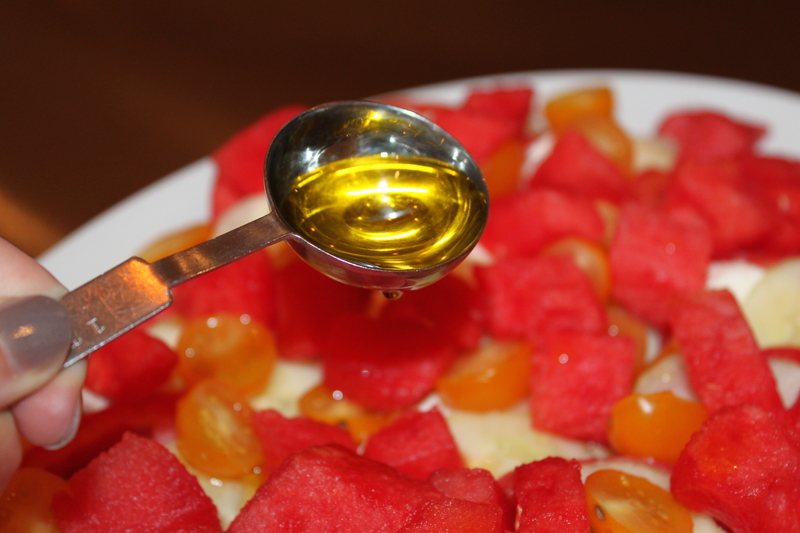 Sprinkle on the cubed watermelon. Drizzle the olive oil onto the salad. 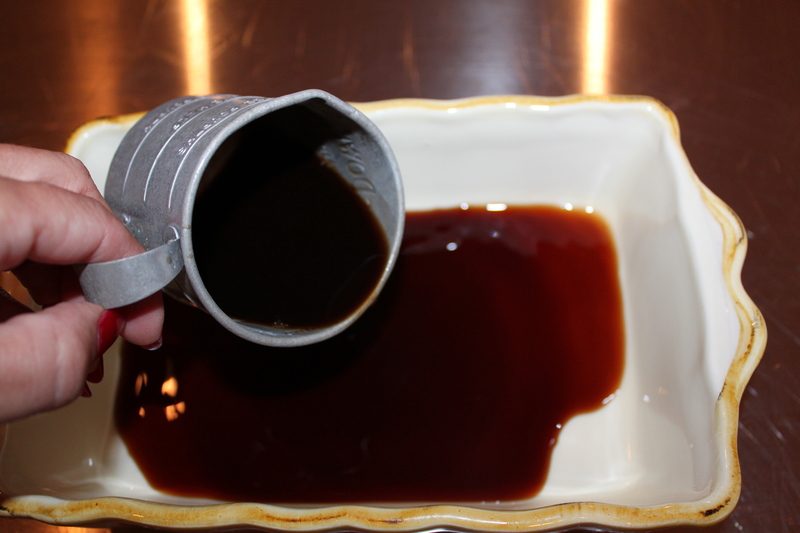 To make the granita, combine the balsamic vinegar and water in a dish. Mix well and set in the freezer. With a fork, we scraped it every 30 minutes. The granita should be almost frozen – a very firm slush. 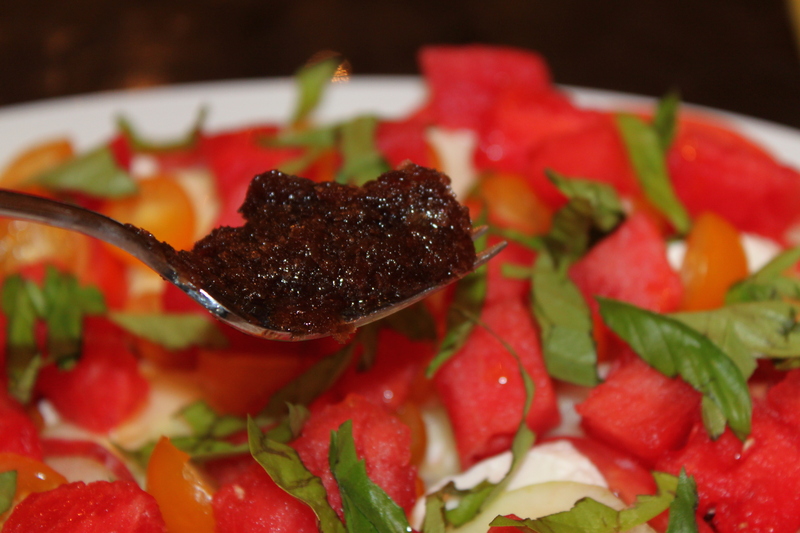 Scrape or dollop the balsamic granita evenly over the salad. Serve immediately. 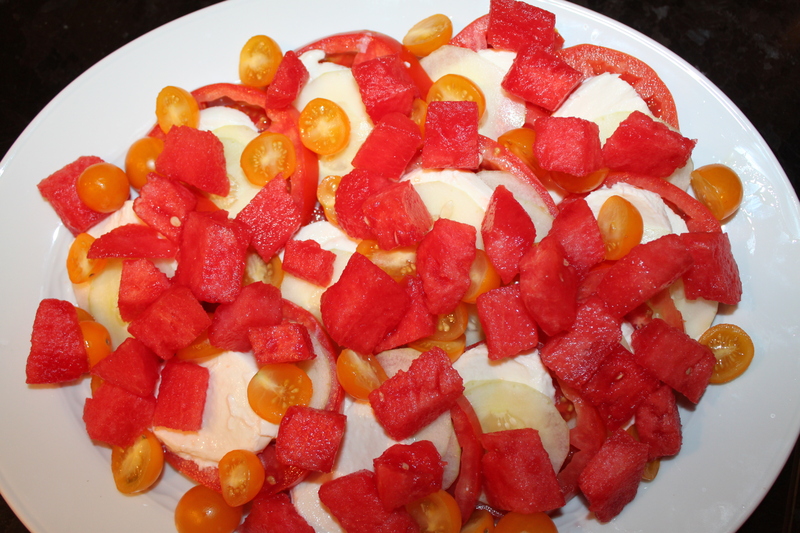 On a large platter, arrange the sliced tomatoes, cucumbers and mozzarella in a slightly overlapping circle; season with salt and pepper. 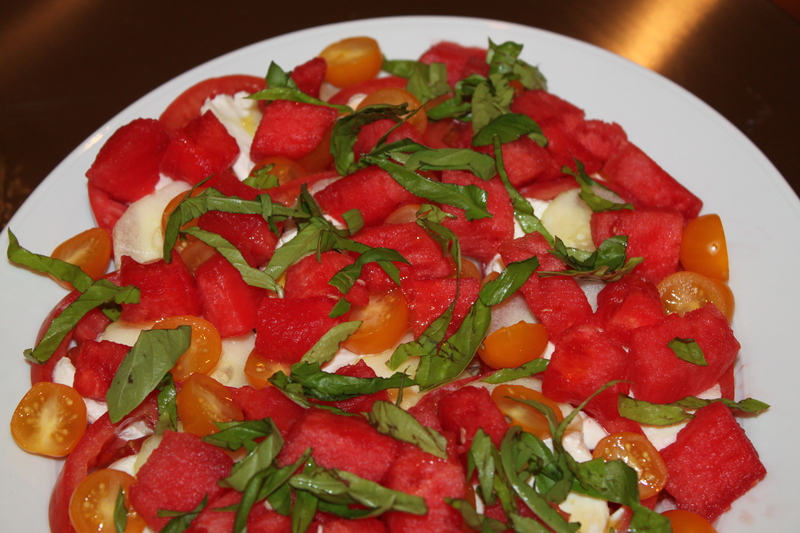 Scatter the cherry tomato halves, watermelon cubes and basil on top and drizzle with the olive oil. Scrape the granita over the salad with a fork, and serve. MAKE AHEAD! The balsamic granita can be frozen for up to 3 days. They say in Heaven, love comes first… but they were totally off. In our Heaven at Blended Kitchen, food comes first. Always. Especially when it’s as heavenly as the halibut dish we’re about to send your way. We’re bringing this dish to you straight from Lake Tahoe – Heavenly Village, to be exact. And, even though we’re on vacation, we wanted to share this delish fish with you, so that you could create your own Heavenly Village in your kitchen. Whip up this dish for your family and they’ll think you’re an absolute angel. And your taste buds will, too! 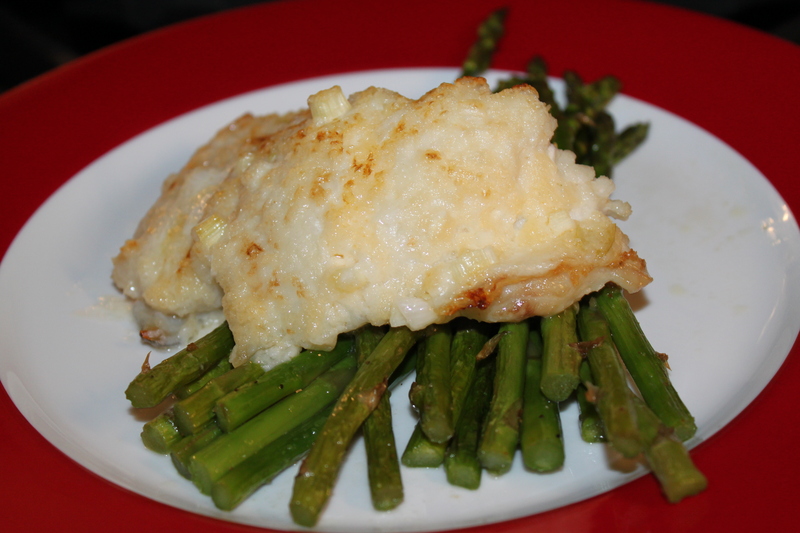 Cindy discovered this fish dish years ago, and it has been one of her favorites ever since. 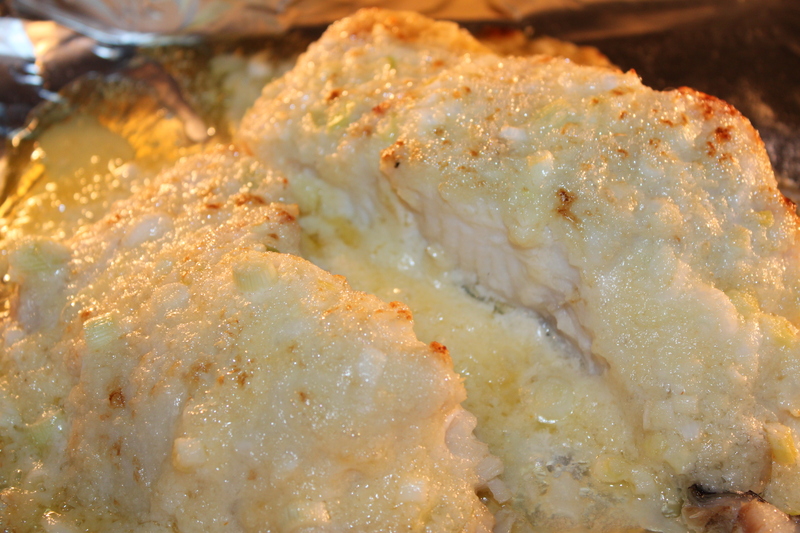 It’s ridiculously easy to make, but the light, fluffy fish and the creamy, cheesy topping make this dish absolutely heavenly. 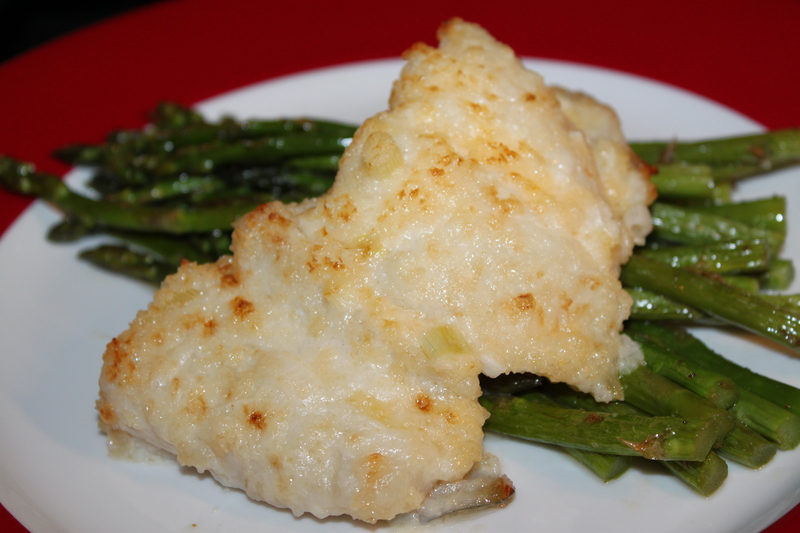 Begin by broiling your halibut for about 8 minutes. Then mix Parmesan cheese, butter, mayo, lemon juice, green onions, salt and hot pepper sauce together for the topping. 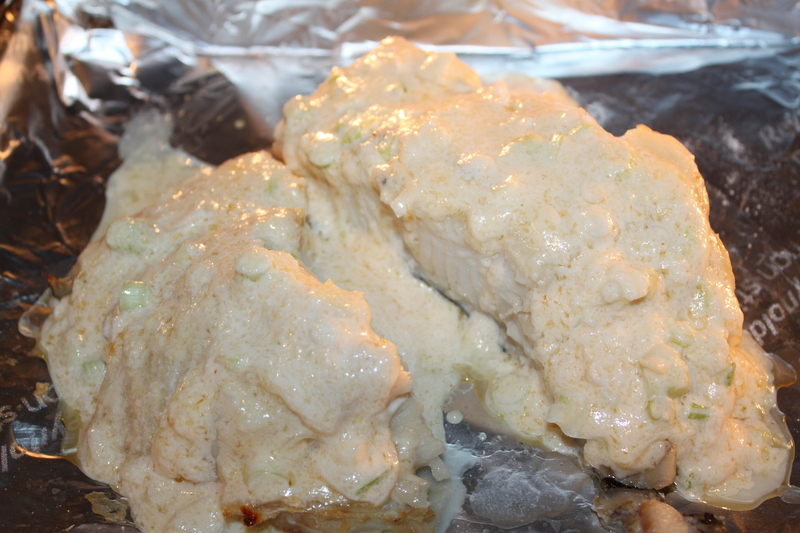 Cover the fish with the cheesy topping and broil for about 2 minutes, or until bubbly and golden brown. Once the topping is golden and bubbly, it’s ready to nom on. We plated ours with some fresh asparagus that we broiled with olive oil, garlic, salt and pepper. It was heavenly. This is the food of the Gods. Seriously.